Fixed oils play a large part in most all commercial beauty treatments. 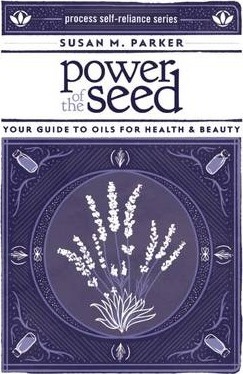 Power of the Seed offers instruction on how to use these oils to create topical skin care, cosmetics, and massage oils. Additionally, Susan M. Parker presents advice and in-depth information on the different types, sources, uses, and structures of these precious oils. Over ninety rare and common oils are comprehensively treated, along with suggestions on how readers can use them to create their own original "recipes." Power of the Seed is the newest release of Process Media's popular Self-reliance Series that presents important DIY information in a visually enhanced easy-to-read and understand manner. Susan M. Parker is the owner and founder of Solum & Herbe, a skincare company that uses a wide range of natural oils to create nourishing, natural personal care products. Susan M. Parker: Susan has extensive experience in the world of natural product formulation using oils. In addition to selling products through her own line, Solum & Herbe, she has taught classes at California School of Herbal Studies and the Northern California Women's Herbal Symposium.